Anderson took the Olympics seriously by working out. Athlete one day? We can all say it started here. 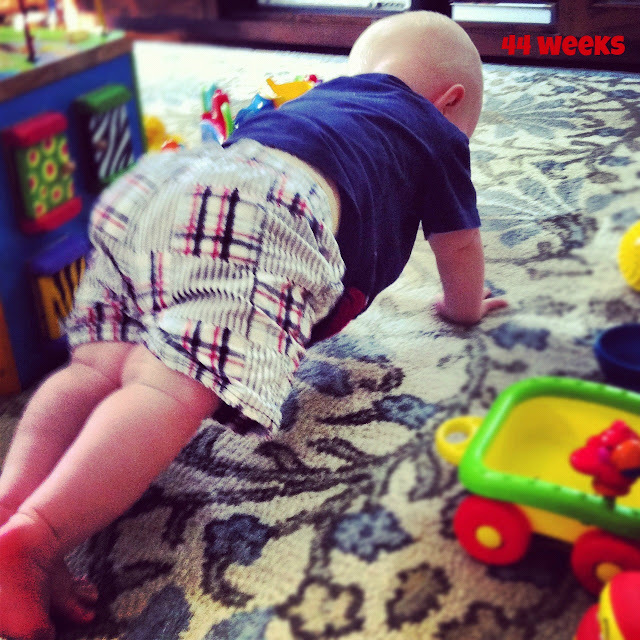 45 weeks and that outfit doesn't fit him anymore. He's just hanging at grammy's playing with some toys. Buddy loves the puppy dog toy but will have to keep reading about dogs and playing with plastic ones until (if) we ever get a yard. 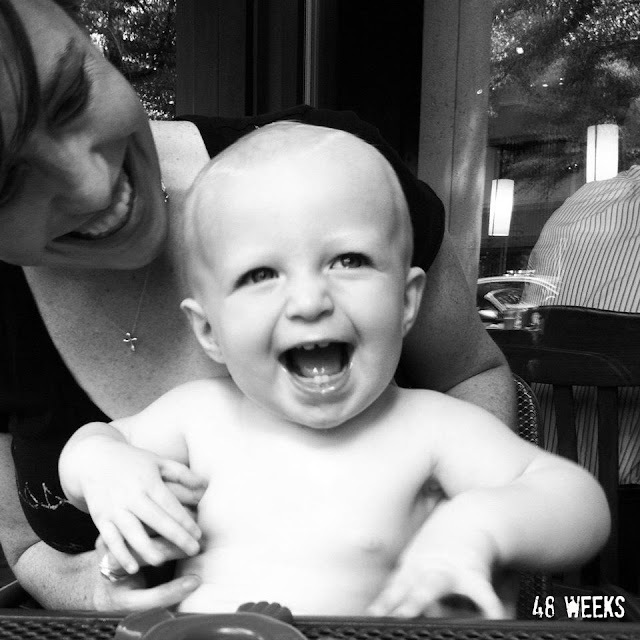 46 weeks: the beach! 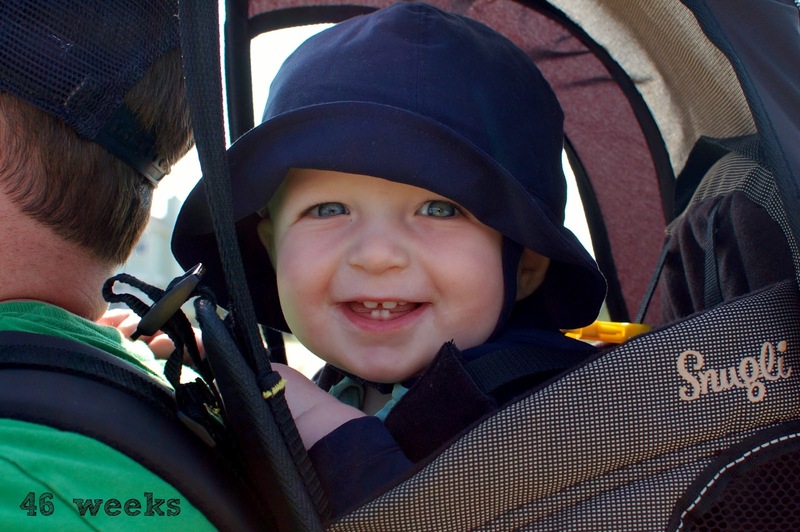 Loving the backpack rides with daddy. 47 weeks. The beach is tiring. Time for a serious nap on the way home. 48 weeks. Basically 11 months! Kate comes for a visit and snaps this shot. What a great representation this is of our sweet sweet boy. He's growing like a weed and today stood for a bit on his own. I'm thinking he'll be walking in a few months. We'll see. Anderson loves his books and will pick one up, lift it up and look at me. When I ask him if he wants me to read it he gets really excited and crawls over for me to read it to him. It's so sweet and I of course love that he loves books. We got a few new ones today thanks to a gift from a neighbor. Sleep has been much better for everyone, although now that he's waking up earlier I've decided I need to 'reverse sleep in' and go to bed earlier than usual so I can maintain some sort of energy by the end of the day. Earlier in the weekend my dad told me he thinks I'll have my hands full with him. I already do but no complaining. 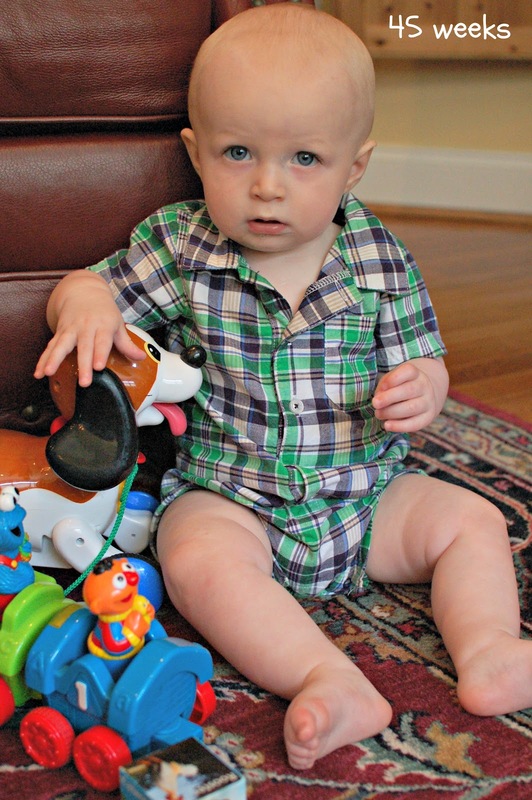 Loving every minute with this sweet one who is growing oh-so-quickly into a little boy! woah, he's got the plank position down. baby yoga?!? Exactly! The kid doesn't mess around.